Where to find View Royal hotels near an airport? Where can I find hotels in View Royal that are near tourist attractions? Room choices are aplenty in View Royal. Expedia's booking page currently contains 80 places to base yourself within a 0.1-kilometre (0.06-mile) radius of the heart of View Royal. Stay near the heart of View Royal. 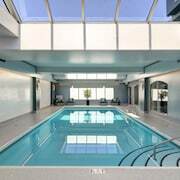 Accommodations in the vicinity include Econo Lodge & Suites and Holiday Inn Express & Suites Victoria - Colwood. The Oak Bay Beach Hotel is positioned 12 kilometres (7 miles) away from the main part of View Royal. 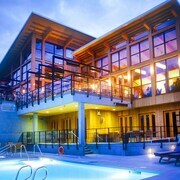 Another hotel is the Brentwood Bay Resort & Spa, which is located 14 kilometres (9 miles) away. The The Fairmont Empress and also the Humboldt House B&B are two other recommended Expedia-listed hotels in View Royal. Like to go a little further afield? Vancouver Island offers many options. Investigate Vancouver Island's old towns. Lovers of nature can also take the time to check out the region's forests and rivers. Fun-loving travelers may also try their hand at snowboarding, skiing and cross-country skiing in this part of Canada. 20 kilometres (14 miles) away from View Royal is Sidney, where you can find Iroquois Park and Rotary Park. 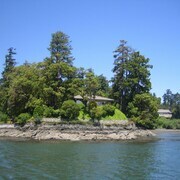 Sidney accommodation options are the The Sidney Pier Hotel & Spa and Beacon Inn at Sidney B&B. 7 kilometres (4 miles) to the southeast of View Royal, you can also stay at Downtown Victoria, which is home to the Victoria Regent Waterfront Hotel & Suites and Delta Hotels by Marriott Victoria Ocean Pointe Resort. 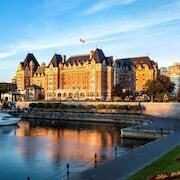 While visiting Downtown Victoria, set aside some time to check out the Chinatown and George Mason's Heritage Home. Get your sports fix with a journey to BC Place Stadium, which is 95 kilometres (59 miles) to the north of View Royal. For those who are keen on booking accommodation nearby, make a reservation in the Fairmont Pacific Rim or Shangri-La Hotel, Vancouver. If you are traveling into or out of Victoria International Airport and are looking to stay nearby try Victoria Airport / Sidney Travelodge or Best Western Plus Emerald Isle. What are the most popular View Royal hotels? Are there hotels in other cities near View Royal? What other types of accommodations are available in View Royal? Explore View Royal with Expedia.ca’s Travel Guides to find the best flights, cars, holiday packages and more!